For tween and teen girls, developing healthy habits is empowering and fun. This collection brims with creative inspiration for self care, with recipes for natural body care products girls can make at home, craft projects for relaxation and restoration, yoga, and more. For today's active, plugged-in girls ages 9 to 13, finding healthy ways to unwind and de-stress is an important part of well-being. 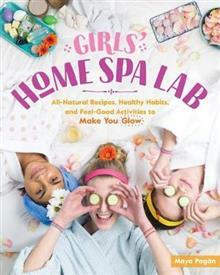 Girls' Home Spa Lab is packed with all-natural recipes, activities, and tips for self-care and relaxation specially designed for tweens. From homemade facial steams and hair masks to foot soaks, tub teas, and body balms, the 50 head-to-toe recipes can be easily made from ingredients found in the kitchen cupboard, like honey, oats, and coconut oil. Girls will also learn how to soothe themselves with easy yoga poses, homemade sleep tea, and natural remedies for a headache, stuffy nose, or sore throat. Maya Pag n's upbeat voice encourages girls to explore their creativity and develop self-confidence while having fun mixing up their own spa treatments. Maya Pag n is the author of Girls' Home Spa Lab, as well as the books Hope, Make, Heal and Reinvention. She is a certified yoga instructor and the founder of the craft blog Maya*Made, and has taught online crafting classes for Creativebug. A mother, blogger, teacher, and Creativity Camp director, she lives in upstate New York.